or even The Red Tornado. A very good case is made for The Woman in Red, who debuted in March, 1940. But Fantomah, Mystery Woman of the Jungle, beat even that venerable character into print by an entire month. That's assuming, of course, you call Fantomah a superhero. Oh, she had the dual identity and the distinctive appearance and the super powers, and she battled evil and all that, but she was a little — well, weird. Fantomah debuted in Jungle Comics #2 (February, 1940), the same issue that introduced The Red Panther, who made a much better fit with the superhero mold. It was published by Fiction House, a pulp magazine outfit with a rapidly expanding comics line. Fiction House had introduced Sheena, Queen of the Jungle about a year and a half earlier, and Sheena's sales returns indicated a few knock-offs were in order. Fantomah was one of them, part of what soon became identifiable as a new genre — white goddesses of the jungle. The source of her name is obscure — a female version of "Phantom", perhaps? 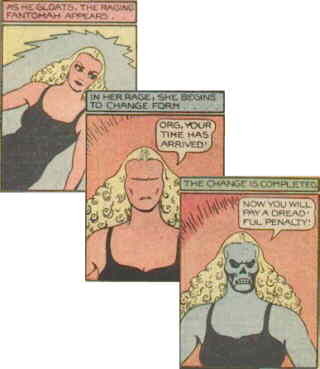 Fantomah came closer than most to living up to the "goddess" part, at least in her early days. A relic of ancient Egypt (as established early on and codified in an origin story in the 27th issue), she was gifted with magical powers. She could transform herself into an ugly, skull-faced creature (leaving only her thick head of curly blonde hair to identify her); and in that form she was apparently, like The Spectre, able to call upon whatever super power she might happen to need. Later, the transformations and reliance on bizarre powers were de-emphasized, and she became more like other members of the genre Sheena founded. The cartoonist behind Fantomah, at least in her early adventures, signed his work "Barclay Flagg" — obviously a house name, as it had been used by others (such as Henry Kiefer, creator of Wambi the Jungle Boy), and it was undoubtedly the same person who did Stardust the Super Wizard and Space Smith for Fox Feature Syndicate. Fantomah, Stardust and Space were all characterized, story-wise, by a wooden prose style and a propensity for giving the main character whatever he needed to get through the page, without regard for story foundation or how it would affect future actions. In the art, he was apparently trying to emulate Basil Wolverton's Spacehawk, but (again) woodenly, and without Wolverton's flair for truly grotesque monsters. He also has scattered credits as "Hank Christy", "Henry Fletcher" and "Fletcher Hanks", the last of which, recent research shows, seems to have been his real name. It was under later creators that Fantomah became more normal. From beginning to end, Fantomah was obscure almost to the point of vanishing. She never appeared anywhere but Jungle Comics. (Some bibliographies indicate appearances in the back pages of Kaanga Comics, which starred a Tarzan clone, but that's apparently an error.) Not once did she appear on the Jungle Comics cover, which usually featured Kaanga. In fact, she was mentioned on the cover less often than any of the other regulars, and when she was, her name was sometimes misspelled "Fantoma". As of #52 (April, 1944), she dropped completely out of the magazine and was never seen again. Big Little Books? Radio shows? Feature-length films? Ha! But she did, at least in the beginning, have a dual identity and a bizarre, distinctive appearance; and she did use super powers to combat evil just like any other superhero. And she was the first female character in comics to do so. Text ©2001-10 Donald D. Markstein. Art © Fiction House Magazines.